In 1799 someone discovered that a medium rare steak has a temperature of about 140*F.
Have you ever burnt a steak on a BBQ? If you want 140*F, why cook a steak at a much higher temperature and risk runing it? Enter "Sous Vide". Today you can go to 5 Star restaurants that cook steaks Sous Vide. You can buy a Sous Vide machine for $399.00 at Bed Bath and Beyond. with "The Fresh Loaf" ? My point was to share information about an unusual method of cooking perfectly uniform steaks. I apologize for placing an off topic post in an off topic forum. I am sorry if I offended anyone. Big name steak houses sear salt and peppered steaks before placing them in the Salamander oven at around 250-300 dF for ~30 minutes. The Salamander oven is sealed providing a steam environment that slow cooks the steak. Sous Vide cooking takes this one step further at a much lower cooking temperature. Steak should not be cooked unifromly. with a good steak than a good loaf of bread! Followed by a great dessert! Inasmuch as this was posted in the "off topic" forum, I would say that the subject matter is perfectly off topic. You didn't offend it just left me scratching my head is all. Just wasn't expecting info on cooking steaks here. No biggie and while we are talking unusual ways of cooking, Iused to cook meals on the intake manifold of my 72 Plymouth. Cooking a meal on a 72 Plymouth was a green project ahead of its time; no extra pollution. However cooking a steak above the interior temperature desired is counterproductive. The reason that Sous Vide is being used so much today, is because it yields more tender steak than higher temperature cooking methods. Imagine a restaurant that could produce a perfectly cooked steak any way you want it, in less than 5 minutes. Have you watched the video and seen the Bed Bath and Beyond ad for Sous Vide? Every summer, it seems that someone fries an egg on a sidewalk in New York City. Anna have you really baked cookies on a dashboard? If so that's ingenious I would love to try that. I wouldn't recommend doing this method using air to transfer the heat. The problem I see with it is that water transfers heat 24X better than air. That means the food is in the critical area where bacteria like to thrive and multiply for a short time. The method is intended for use with a vacuum sealed food in a bag, lowered into water of the proper temperature. The product quickly warms due to the conductivity of water and is safe, health department wise. I say this having been cooking with a home made Sous water oven for a couple years now. While it is the best way to cook protein I know of and many 4 Star restaurants use the process, only water should be used to heat the product.You are fooling with dangerous bacteria otherwise. When you have meat in direct contact with a pan, the heat transfer is very fast on that side. On the top where 0.002" to 0.004" of plastic covers the top of the steak, the insulation to the 140* F air is negligible. If you have ever cooked brisket overnight at 225* F, you would know that it works better than a shorter cook time at higher temperature. Since I have cooked 1-1/2" steaks Sous Vide in 3 hours, I am positive that there is no need to use water. AAMOF Sous Vide has the steak insulated with plastic on all sides; lesser heat transfer than in a pan. The plastic 'sees' 140* F water. Using the Stu Vide method in a pan, the steak 'sees' 140*F pressed against the pan. Rethink the physics and I am sure that you will come to understand the 'dry' method a little better. P.S. Out body temperature rises to a little over 100* in order to fight bacterial infections. "Fever is actually the body's natural way of defending itself from invaders like viruses and bacteria, because many of them can't survive in the body due to the high temperature caused by a fever. High body temperatures also signal infection-fighting cells of the immune system such as phagocytes, neutrophils, and lymphocytes to come to the body's defence and help fight off infections." 140*F is an environment way above fever temperature. Put a couple of pieces of Salmon or Beef into a tin foil pouch, add olive oil and seasonings, add some baby carrots (asparagus works nicely too) and some 1/4 cut medium potatoes. Close the tin foil pouch tightly so that it doesn't leak, I used to wrap it in several layers of tin foil. Duct tape the pouch to the top of the intake manifold (probably needs to be an older car since you can't even see your intake manifold on new cars) Drive 1/2 hour to 45 minues hour or so to a nice park or the beach. Remove tin foil pouch from intake manifold open and serve. It gets really hot on top of the intake manifold and it cooks a very nice pic-a-nic lunch or dinner on the drive. Wouldn't the exhaust manifold make a more efficient cooker? An exhaust manifold does not have a flat area to tape your pouch to, they are vertical coming off the engine not horizontal, they are giving off a great radiant heat under the hood though which is also helping to cook the food. Also, if you could strap the food directly to an exhaust manifold it might burn, exhaust manifolds can reach temps up to 1700 Degrees F or so. The top of the intake manifold is flat and uses the radiant heat of the entire engine bay to cook the food. Seems Widepedia thinks the exhaust manifold is a better heat source as well. You guys can't be serious. Who would eat something cooked in their car engine? :) Funny to think about though. I used to do it a lot when I had my old Plymouth, we'd go on hot rod runs and I'd cook while we were driving and eat when we got to our destinations. The engine compartment is a really big oven. Model T Fords had a Manifold Cooker Accessory so it's been done since the earliest of cars. In fact I know some people in the Long Beach Model T Club that use their Manifold Cookers when they go on outings with the club. So, to answer you, Yes, I am quite serious and yes the food is quite tasty. That's cool man. :) Sounds like fun. As for fumes, I wouldn't cook something in the tail pipe and eat it, but on the intake manifold there is basically just hot air around and the food is sealed in the tin foil so there is really nothing to worry about. It's roasted Salmon and veggies much better than McDonald's, although I do enjoy me some Double Cheeseburgers!!!! 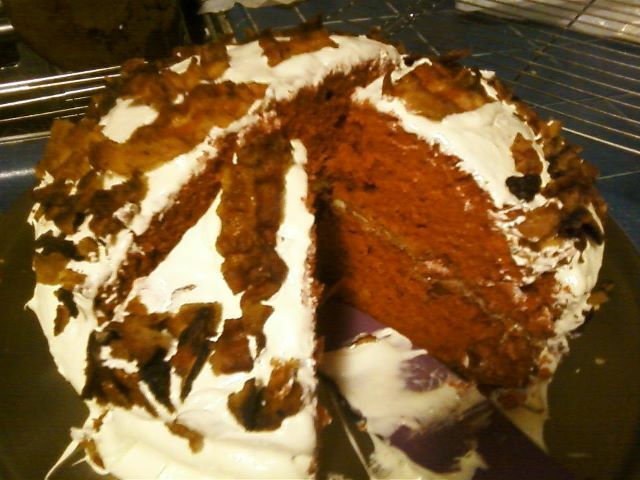 While we are off topic I made a Bacon Cake tonite that was great!!! Not judging or anything! Just curious is all. Can we get pics of the Bacon Cake? Would love to see it. Anna it is simply your favorite Red Velvet Cake recipe, only if you recipe calls for pecans replace them with bacon. If your reciped does not use pecans then fry a package of bacon (between 12 and 16 ounces)extra crispy and crumble. To the batter add about 1/3 of the bacon crumbles and use the rest to decorate the top of the cake with. complement the bacon :) Yum! Oh that does sound good I'm gonna have to try that, as is it's a great mixture of sweet and salty. cooked on a car manifold, and the water bath sounds interesting, cooking with a hair dryer is getting way out there, number one its not my idea of green, if you want to cook something in a small or confined space, the microwave (although I don't like meat cooked in it) the crockpot (long slow cooking is its specialty) or a nice solid cast skillet with good lid, and/or a cast dutch oven with same are all much easier to cook with than a hair dryer. The second thing is I don't like medium rare, or anything that isn't well done. I've done steaks in the crock pot (two small well seasoned marinaded steaks, a whole onion and let it cook for a couple hours or more) which come out so tender that you can actually cut them with a fork. I rarely cook on a grill or frying pan, (the grill is hubbies province and I don't touch it really except to bake shortcakes on in the summer heat, better than turning on the oven in the house) because I can't get them to be nice and tender. But each to his own as the old lady said as she kissed the cow! If you cannot cook a steak on a BBQ without runing it you should not be alowed to cook. I want my steak to suffer from superficial third degree burns and still show signs of a chance for resusitation on the inside. In other words quickly grilled over a very hot fire to cook the surface dark and bubbly and leave the inside bloody. I BBQ 2 or 3 nights a week and smoke something a couple of times a month, right now the favourite smoked meat is brisket. I think the caramelization on the exterior of the meat really adds to the flavour and texture of the meat, that has more to do with my enjoyment of the meal than the exact temperature of the steak.